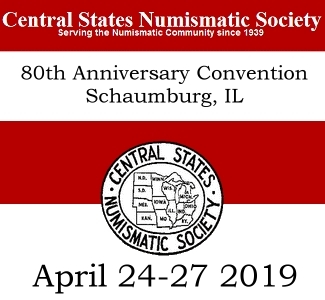 The Chicago Coin Club reaches several major milestones in 2019, which gives you, our members, the opportunity to participate, volunteer, celebrate, add to your collection, read, reflect and in general have a great time. Whether you’re an active collector or haven’t added to your collection recently, we hope you’ll pause for a moment to find out everything we have going on this year and participate in some or all of the fun. Club 100 Year Anniversary: 2019 is the official 100th anniversary of the Chicago Coin Club. 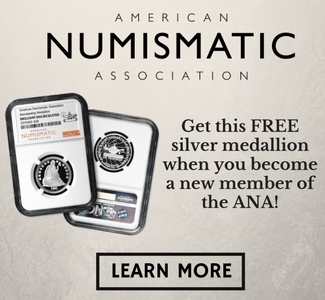 One hundred years ago February 14, 1919, marked the chartered beginning of the CHICAGO COIN CLUB as ANA Branch #1 – the first chartered club in the American Numismatic Association. In celebration of this milestone we have a long list of activities we hope you can enjoy. Club Patron Century Club: Join the group of numismatists that have become patrons for the 100th Anniversary. The first 100 persons to contribute $100 or more will receive a “CENTURY CLUB” pin that was designed especially for this momentous occasion. Patrons at ALL levels will be recognized in the 100th-anniversary official program. Become a patron by sending your contribution to CCC “Century Club”, PO Box 2301 Chicago, IL, 60690. Hurry, we are halfway sold out of this opportunity! The Club’s 1,200th Meeting: On January 9, 2019, the club celebrated our 1,200th club meeting with 42 members and four guests in attendance. 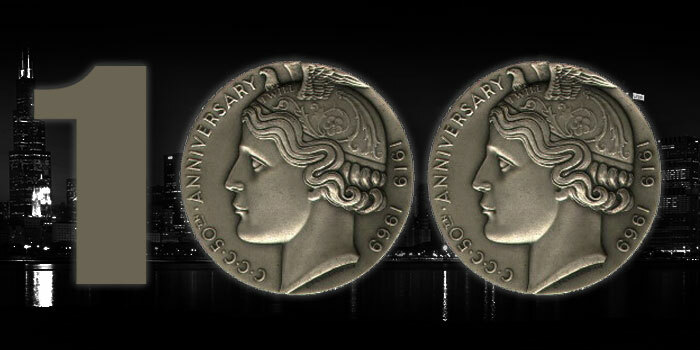 Everyone received a special elongated Walking Liberty half dollar with the date and 1,200th information on the reverse and a special brass plate commemorating the 1,200th meeting. The Chicago Coin Company generously sponsored a reception with food. 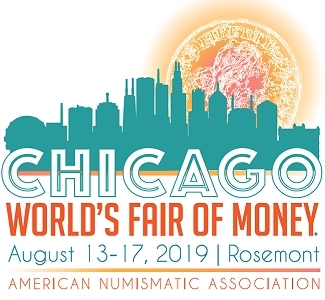 Club Hosts ANA 2019 World’s Fair of Money: 2019 sees the return of the ANA World’s Fair of Money® convention to Rosemont, Illinois with the Chicago Coin Club as Host Club. 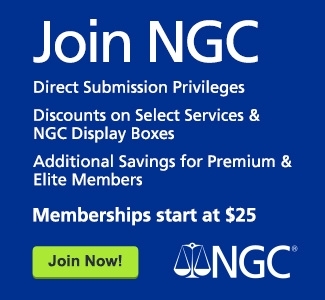 This year’s convention is August 13 – 17, 2019. Not only is this a great time to attend the local show but also to take an active part as a volunteer. We are looking for volunteers as CCC ambassadors to help with each day’s crowd, registration lines, questions and more. Contact Carl Wolf or Scott McGowan for the volunteer form to sign up. You can volunteer for one day, two days or the whole convention. We are also planning a Boy Scout merit badge session as part of the Youth Committee activities. We will have our Club table on the bourse floor with CCC 100th Anniversary and other items for sale. If you have or know of a youth age 13 – 21 years old that wants to become a page on the show floor to assist the bourse dealers, you can complete a Page application to submit directly to the ANA (page applications must go directly to the ANA). Club 100th Anniversary Medal: In keeping with the tradition of past club events and milestones, the Club will issue a 100th Anniversary Medal. The medals obverse and reverse designs are in the final design and review stages and details will soon be released on the various metal content versions, quantities and price. Stay tuned, these will sell out fast. Club 100th Anniversary Banquet and Medal: In conjunction with hosting the ANA World’s Fair of Money in August, our club will host a celebratory banquet at Gibson’s Bar and Steakhouse in Rosemont, Illinois on Tuesday, August 13, 2019. Seating is limited to 115 individuals so reserve early. 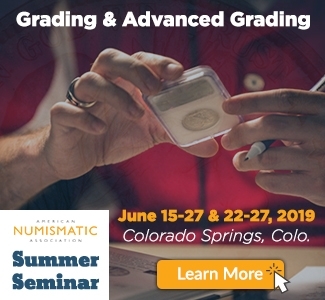 Club member deadline is June 1, 2019, before we open this to the numismatic community at large. The dinner cost is $100.00. It will be a family-style meal and feature guest speaker Clifford Mishler, whose history, knowledge and stories are bound to be great. Attendees will also receive a special 100th Anniversary Banquet Medal, different than the 100th medal, plus a special edition Red Book® (see below) and more. Reserve at CCC BANQUET RESERVATION, PO BOX 2301, CHICAGO, IL, 60690. All reservations must be accompanied by payment. Club Special Edition Red Book: The club will publish a special edition Red Book (A Guide Book of United States Coins). This special edition will have custom CCC front and back covers and a two-page CCC history section detailing the founding of the club. This will be a limited edition and will also sell out fast. The book price is $17.50 (add $3 for shipping but we prefer you pick up at a club event). Note: Individuals attending the August banquet will receive one copy of the CCC special edition Red Book as part of their ticket. Paid orders can be sent to CCC REDBOOK, PO BOX 2301, CHICAGO, IL, 60690. All orders must be accompanied by payment. Club 100th Anniversary Elongated: The 100th Anniversary committee is looking into creating a special elongated coin for the 100th anniversary year as a token of the occasion and for those who enjoy numismatic elongated coins. Stay tuned for further details. Club Auction: The November meeting always hosts the annual CCC auction with many treasures coming up for auction whether they be coins, tokens, medals, books, scrips, encased postage or any other treasures. This year’s auction is scheduled for November 13, 2019 at the Chicago Bar Association offices where the club meets. Will a 1,200th Meeting elongated appear in this year’s auction lot? Will a 100th-anniversary banquet medal? Will a CCC special edition Red Book or two get auctioned off? Only time will tell. But if they do, you will surely want to be there to bid for these limited pieces of Chicago Coin Club 100th anniversary mementos. Club Holiday Banquet: As celebrated in the past, the Chicago Coin Club traditionally reserves the December meeting for the annual holiday banquet. As 2019 comes to a close we expect this banquet to pay tribute to a year of milestones, memories, and toast to another 100 years of numismatic fellowship. The banquet takes place on the normal meeting night which is the second Wednesday of the month or December 11, 2019. This year’s location is still being planned, but you can always make sure the date is on your calendar. So no matter how much you do or don’t get to participate in during this 100th year, the holiday banquet event is the perfect wrap up to the club’s first 100 years.